Children are likely to have encountered mathematical concepts in real life before the formal introduction to the subject. 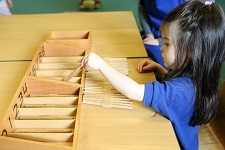 Different areas of Montessori curriculum continue this indirect preparation. For example the concept of matching is central to the Sensorial activity of colour boxes and the concept of one to one correspondence relates to the Practical Life activity of opening and closing different sized containers. The Montessori Maths programme aims to give children the opportunity to talk, touch and experiment with the relevant mathematical concepts long before the formal teaching of mathematics is introduced. In this way mathematics becomes more tangible and knowledge occurs with an in-depth understanding rather than through memorisation. By understanding concepts we give children the opportunity to master mathematics and provide them with a solid base on which they can build. 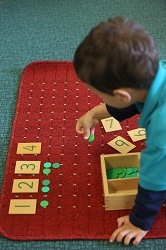 Montessori mathematical materials help children to move from concrete to abstract, and from simple to complex. There is a natural progression in the level of difficulty of materials and children’s learning is scaffolded every step of a way from counting to understanding fractions. One of the first mathematical materials to be introduced is “Number Rods” which introduces the child to counting up to 10 using whole quantities. This exercise is followed by Sandpaper Numerals the objective of which is to teach the child written symbols to match the previously learned quantities. This progression of exercises is also a good example of going from concrete (number rods as physical objects) to abstract (symbol representing quantity).